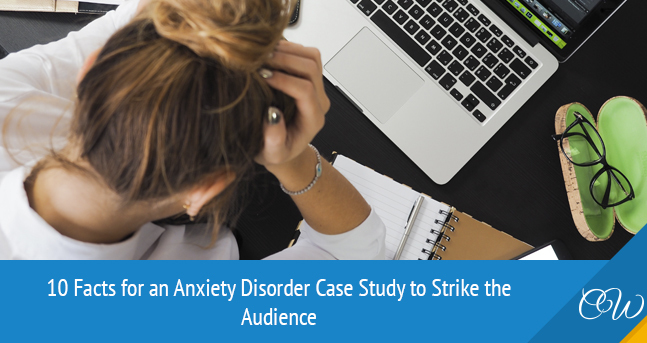 If students must investigate the anxiety disorder case study, they should present the facts and evidence. Otherwise, the paper will lack research and can be banned because of unreliable and not real information. That’s why students should do a thorough research, analyze data, and then present it in the paper. Look at the following facts to see what you should look for. According to research data, women are more vulnerable to stress factors and more frequently suffer from anxiety disorders. The Epidemiological Catchment Area has found out that 9.7% of females from the five chosen states of America had all anxiety disorders compared to 4.7% of men. 11.7% of women aged from 25 to 44 suffer from anxiety disorders when only 4.7% of men of the same age turn to their health advisers with the same mental problem. 2.8% of American adult population (18-54 years old) realizes that they have generalized anxiety disorder after clinical testing yearly. As a rule, kids and teenagers acquire such a health complication, but today the number of ill adults grows daily. People who are diagnosed with an anxiety disorder have more chances to get injuries, cardiovascular problems like too low or too high blood pressure and heart diseases, and be hospitalized than those who have no problems with the nervous system. The scientific survey shows that the most typical anxiety disorder is a specific phobia. Almost 12% of the world population has a specific phobia or even phobias. Patients have a rapid heartbeat, shortness of breath, and shiver. For instance, there was a 9-year-old boy who was afraid of buttons. Agoraphobia is an example of possible anxiety disorders. Patients who have to deal with it feel uncomfortable and even experience panic attacks when they cannot find the way out of the situation or an exit door. When they feel extreme pressure, they try to escape the situation. For example, a 30-year old woman experienced her first panic attack when she was surrounded by football fans at a football game. She had hardly found an ambo to get to the ambulance. One of the most dangerous and common disorders is a generalized anxiety disorder. It lasts long (6 months and more) and can be provoked by any stress factor. What’s more a patient feels bad all the time and the health state is getting more and more complicated daily. A patient experiences constant fatigue, cannot concentrate on something, is unable to rest, is very nervous, and has muscle stiffness and insomnia. A person can also complain of headaches, abdominal pain, fast heart beating, and restlessness. For instance, a 28-year-old Caucasian woman turned to her physician because she felt pain in her joints and back. In addition, she couldn’t fall asleep and worried about each detail of her life. Her doctor diagnosed GAD that was the result of depression, alcohol addiction, hypertension, and daily stresses. People who cannot stand being among people or hold a speech in front of the audience suffer from social phobia. They try to avoid public places and often blush, sweat, and cannot speak distinctly in case they experience phobia attack. For example, a 30-year old Jim was afraid to communicate with people he didn’t know, and his wife had to solve all social issues. When his boss sold the business, the man had to deal with new people and responsibilities. Consequently, those worries brought him to a hospital. Many people experience post-traumatic stress disorder. It’s the result of traumas which a person get at some car crash, natural disasters, assault, child abuse, hostage cases, and serious accidents (at war, job, or military service). A person is afraid to live that situation again and starts avoiding vehicles, dark places, etc. For example, a disabled veteran had PTSD and he couldn’t live normally because he was always afraid of enemies and possible shots. He didn’t trust his family and friends and thought that the danger was everywhere. His physician prescribed a number of pills to let him fall asleep, feel less worried, and get rid of muscle spasms. Approximately 1% of people around the world have selective mutism. It’s inability to speak in some situation or at the presence of some people. People don’t speak even if they can be punished. A 4-year-old Greek girl refused to speak and used only gestures in conversation after she had been bitten by a dog. It turned out that she took offense at her mother because her mother hadn’t protected her from the dog (the girl played unsupervised outside). People have separation anxiety disorder when they feel anxiety being away from some people (friends, relatives, etc.) or their apartments. A 13-year-old boy couldn’t attend school and stay at his friend’s home because of SAD. So, you can see that a good paper requires reliable and trustworthy facts. Don’t be lazy and get striking and good information to support your research paper.